On January 22, GrowNYC celebrated National Swap Day with the second of five Stop ‘N’ Swap events taking place across the five boroughs this winter. More than 300 New Yorkers stopped by I.S. 52 in Manhattan to donate perfectly usable items and partake of the bounty that may have otherwise gone to waste in a landfill. Swappers took satisfaction in seeing their unwanted stuff put a smile on other’s faces and found joy in discovering great things they could use, at no cost to themselves or the environment. Clothing, books, toys, electronics, cookware and even a bike complete with training wheels quickly found new homes, leaving staff and volunteers an easy clean-up at the end of the day. The Stop ‘N’ Swap comes to the Bronx, Queens and Brooklyn in February. On the ten-year anniversary of the New Farmer Development Project, the project completed another successful farmer training class, La Nueva Siembra. Designed specifically for immigrants with agricultural experience who are interested in starting their own operation, the course concluded a successful run with 13 graduates. These future farmers hailed from Guatemala, Mexico, Taiwan, Haiti, Guyana, Jamaica, Puerto Rico and the U.S., and learned to develop business plans as diverse as their backgrounds. From an online mushroom CSA to urban aquaculture, their ideas are now entering the new planning phase, with individual assistance from the NFDP staff for the 2011 growing season. Offered Tuesday evenings from October to December and concluding with a weekend intensive, La Nueva Siembra covered a wide range of topics including Goals and Skills Evaluation, Finding Land, Finances, Labor and Development Laws, and Marketing and Production Plans, to name a few. To increase the effectiveness of the curriculum, many students took advantage of workshops organized by NFDP and its partners throughout late summer and early fall – Marketing in the Market, Seed Saving, Farm Tour and Tractor Safety. Participants also had the opportunity to attend various conferences with the NFDP staff and current farmers throughout the fall and winter, and will continue to do so as 2011 progresses. As “real world” complementary elements to the class, four guest farmers gave presentations, advice, and answered the multitude of questions for class participants. The NFDP sincerely thanks Martin and Gaudencia Rodriguez, Sergio and Paz Nolasco, Jorge Carmona, and Nestor Tello for sharing their precious time and invaluable experience with the LNS class of 2010! Congratulations to all the graduates and best of luck! We all look forward to following your stories as your farming plans unfold! Green Grades: NYC Schools Recycle! NYC public schools have a goal to double their recycling rate by 2012. With around 1,600 schools in NYC, there needs to be model recycling programs for schools to emulate. Green Grades is a short film that highlights the efforts of two NYC schools that make recycling easy. GrowNYC’s Recycling Champions program is helping multiple schools in each borough become model recyclers. For Green Grades, Recycling Champions partnered with the NYC DOE Sustainability Initiative, videographer Pamela French, and the NYC Department of Sanitation’s Bureau of Waste Prevention, Reuse, and Recycling to demonstrate how a successful recycling program is a team effort. Read more about Green Grades: NYC Schools Recycle! 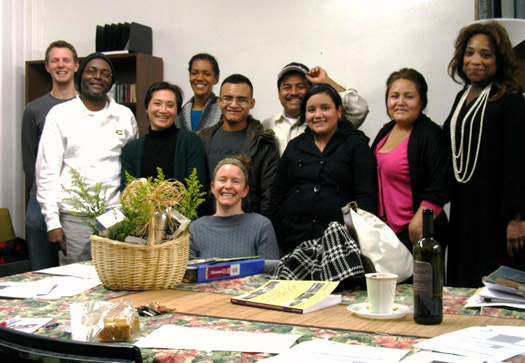 In 2009 and 2010, GrowNYC hosted Compton Mentor Fellow Mara Gittleman. Mentored by Open Space Greening Assistant Director Lenny Librizzi, Mara's first project was updating the community garden information on OASIS, a powerful GIS-based online map that allows users to view details about every block and lot in the five boroughs. This was the first full-scale update to the community garden information in many years. How many community gardens are there today? How many grow food, and which crops? The results are astounding! 80% of responding gardens grow food, 65% compost, and 43% partner with at least one local school. Read the report (PDF 6.92 mb).